What Does CFD Body Language Look Like? Most of the time, my jokes are greeted with polite laughter or uncomprehending stares. Certainly no one wants them to be repeated. So when someone asked me to blog about this little cartoon I had to jump at the chance before they changed their mind. 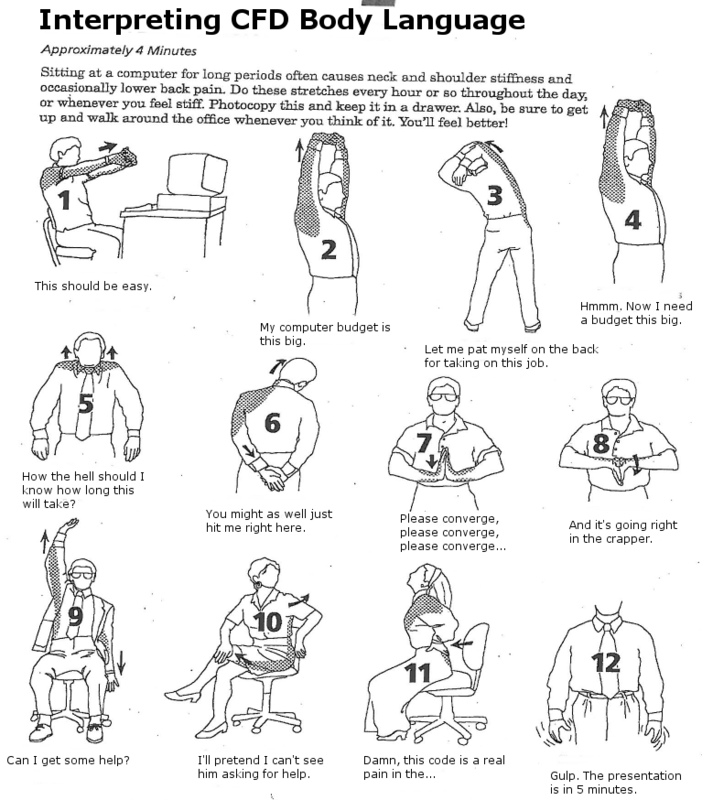 As part of our wellness program we had a lunchtime presentation on fitness from an exercise physiologist and one of the handouts he distributed illustrated stretches you could do while seated in front of your computer. Well, I didn’t see people stretching. I saw people doing CFD. Hence, CFD Body Language. I can see the uncomprehending stares now. This entry was posted in Off Topic and tagged CFD. Bookmark the permalink. 6 Responses to What Does CFD Body Language Look Like? Thanks, Charles. You’re now responsible for your own uncomprehending stares.